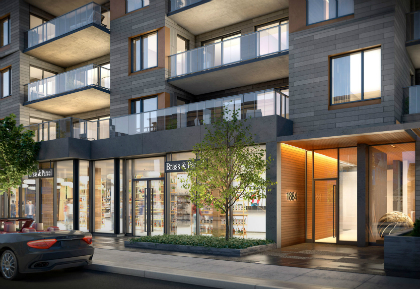 On November 12th at noon sharp, we will open the doors to our new Heartwood sales office at 1887 Queen St. East. We will be showcasing kitchen and bathroom vignettes, as well as the new floor plans. 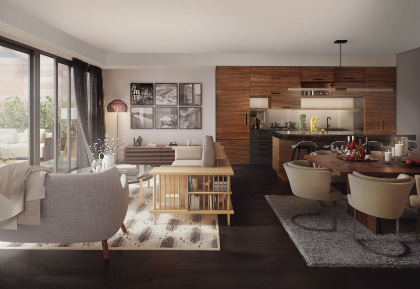 Upon entry, you will receive a new brochure highlighting the new designs and features of the Heartwood suites, such as the oversized balconies and terraces with water and gas bib connections (as per plan). Also, light refreshments will be served! A few other quality interior features and finishes include 9’ ceilings, integrated Bosch* appliances (including gas cooking), a spacious chef’s pantry, and a stunning wood feature wall. While improving our suite designs, we also managed to lower the monthly maintenance fees to $0.50 a square foot! 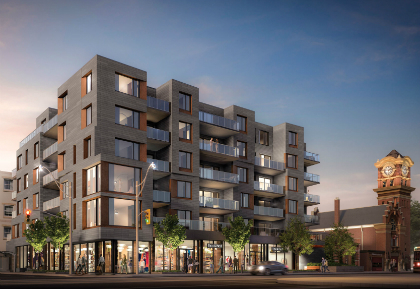 Located on the northeast corner of Queen and Woodbine, Heartwood is at the centre of The Beach neighbourhood, surrounded by independent shops, cafes, restaurants, and reliable Queen St. transit (streetcar). To celebrate the unveiling of the new suite designs, we will be offering special November incentives, including $5,000 or $10,000 credit on closing, and a free gas barbecue for your balcony or terrace. Remember, doors open at noon at 1887 Queen St. East. There are 43 suites in total and with the special incentives being offered, we recommend arriving early! Can’t wait to meet you on November 12th!